Early one morning, while driving near Flagstaff, Arizona, I came across this pair of horses grazing in a meadow. I’m sure they weren’t wild, but I like the feel of the shot. Below is something also fitting the category. 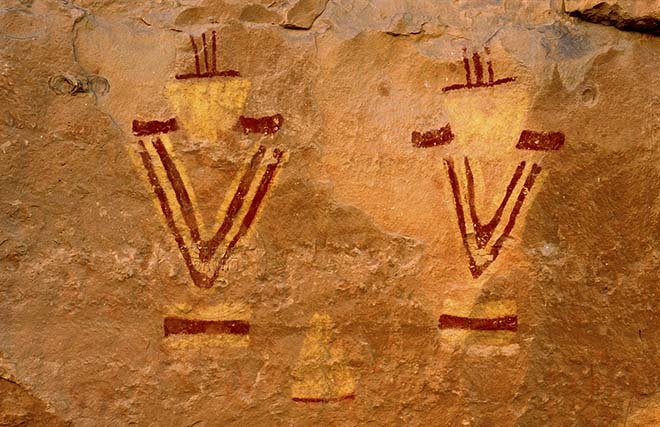 I’ve always called this one “The Twins” because I’ve found it unusual to see similar rock art side-by-side. This panel of pictographs is in the Grand Canyon. Both of your photos give off way different feelings. I like them very much. Thanks so much for playing. Much appreciated! Hopefully I’ll have more time to play along on future challenges. Congratulations! I have selected this post to be featured on Cee’s Fun Foto Challenge! Thank You! Hope you are having an awesome week yourself! Congratulation to being featured by Cee! Your images are fantastic, the header images is my favorite … stunning image. Thank You! And it’s always nice to be featured by Cee! Love your photo of the horses. It’s so evocative. And thanks for liking my post “Face to Face”. I’m glad it brought me to your site. The horses were undisturbed by my close presence, and I think the mood of the photo came off as serene as the morning was. Thank you, Mick! I’m glad you found your way to my site and took the time to comment. Well worth it, just keep taking more pics.